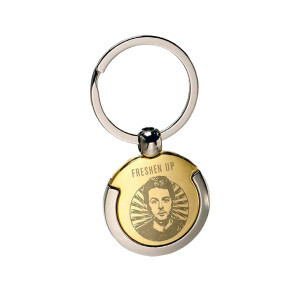 Gold and silver keychain featuring Paul McCartney photo on the front. This key chain is a beautiful keepsake. The imprint is very light, and the back is plain. It is a very classy piece. If I were to use it as a key chain, I'd order another one and save one to prevent any scratching, etc. Well worth the price for a very 'lucky charm'. God Bless Paul McCartney, forever and ever .. Thanks, Paul, for a world of good music, and a very respectable life of family first, and enjoyment equaled. Rock on! Great keychain! Is the back of the keychain Paul now (2018)?